Dimensions 0.50 by 9.25 by 12 in. 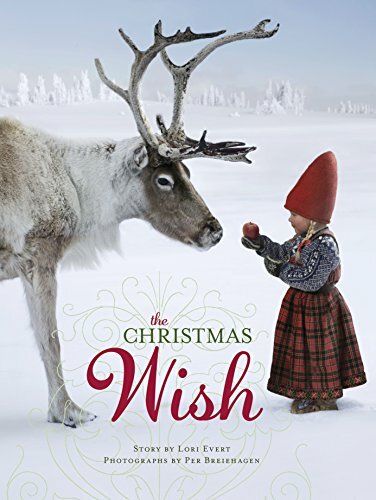 Amazon.com description: Product Description: This New York Times bestselling Nordic tale in the tradition of The Snowman,Â The Polar Express, and the many books of Jan Brett will have readers of all ages believing in the magic of Christmas. This is one to pull out every year and savor! Long ago, a brave little girl named Anja wanted to be one of Santa's elves.Â So she leaves a note for her family and helps her elderly neighbor prepare for the holiday, then she straps on her skis, and heads out into the snowy landscape. From a red bird to a polar bear to a reindeer, a menagerie of winter animals help Anja make her way to Santa. A generous trim-size, matte cover, extraordinary photographs, and foiled title make this a special book for the holiday season. The Puppy's Wish -- coming soon! About: This New York Times bestselling Nordic tale in the tradition of The Snowman, The Polar Express, and the many books of Jan Brett will have readers of all ages believing in the magic of Christmas. About: This New York Times bestselling Nordic tale in the tradition of The Snowman,Â The Polar Express, and the many books of Jan Brett will have readers of all ages believing in the magic of Christmas.